← A Call For Calm Reason When Discussing This Alleged MTA Charter Amendment, PLEASE! Coming back from dropping my kids off at school, I came up 14th Ave in front of St. Anne’s. The N-Judah was stopped in the middle of the intersection and a paratransit van was blocking the street. As the on-scene Muni employee was recording information on their accident sheet, some people were getting off of the paratransit bus and walking around, leaving. The bus driver was walking around as well, going into the church at one point. It was hard to tell who was who. I kept hearing the bus driver telling the Muni guy that there were no injuries. I watched for a minute and realized nobody was watching the folks in the van and that some of them were injured. A quick call to 911 would solve that, right? NOPE. Took 2 calls and almost 10 minutes before the first PD officer arrived. SFFD arrived right afterwards and took over. They calmly started evaluating everyone and found that there were in fact multiple injuries and that the passengers weren’t able to evaluate themselves or communicate. Funniest part? Watching the scene unfold and the calm atmosphere with everyone doing what they needed to UNTIL the lady that was obviously the MUNI manager in charge got there. Took her 5 tries to parallel-park her car before she got out and started barking over the radio. Tension escalated, voices rose, radios chattered and the calm disappeared. Another example of how NOT to manage a scene. Last I saw, the SFFD was loading the passengers into another bus for a hospital trip for a better checkup. We need a stop sign at this intersection. Hopefully no one was seriously hurt. People using roads near any Muni train need to realize that these huge machines can’t stop on a dime, and you have to pay attention when driving near any Muni train. That’s not a commentary on Muni operators – that’s just a simple fact. 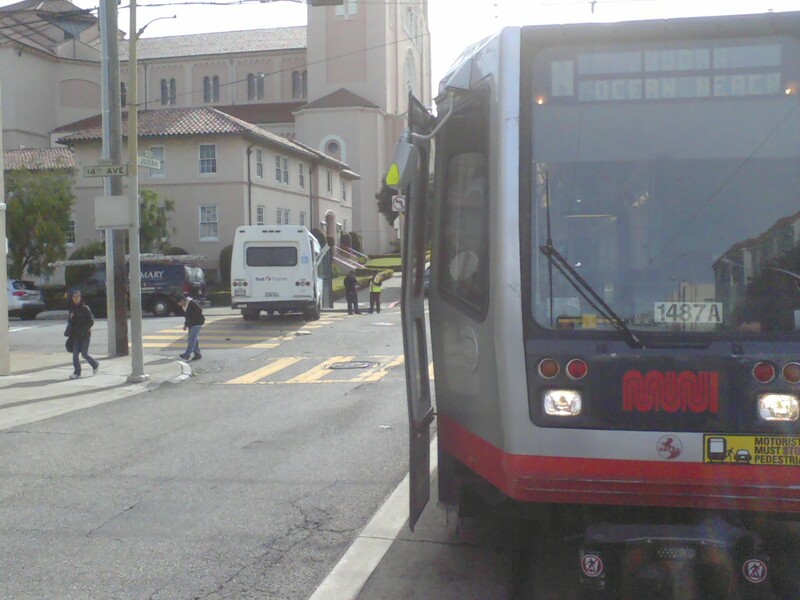 Even under the best of circumstances, stopping a rolling Muni train takes a while – that’s just physics at work. Likewise, Muni operators are challenged with many things going on around them to keep track of as they pilot a bus or train in urban areas. UPDATE: Examiner coverage, SF Appeal coverage and SFist coverage of the incident. NO, NO, and NO!!! A traffic light? yes. A Stop sign making a two car train full of commuters stop for a single or even multiple rider minivan is wrong. Muni is sabotaged by Stop signs all over town which should be traffic lights w/ demand loops for cross traffic and preference for transit. I agree with David. We do NOT want new stop signs on Judah, we need to remove them! Stop signs slow down this rail line, the busiest in the city. If crashes are a problem, a light with transit priority would make sense. At any rate, how hard is it to miss the N? It doesn’t move very fast and it’s path is predictable.